"When He had been baptized, Jesus came up immediately from the water; and behold, the heavens were opened to Him, and He saw the Spirit of God descending like a dove and alighting upon Him" (Matthew 3:16). Keep faith at the center of your life and your jewelry collection with this gleaming cross pendant from Apples of Gold. Crafted from premium 14K yellow gold, the pendant features a beautiful winged dove at the center of the piece. This Christian symbol is echoed by the cross figure that provides the framework of the pendant. The Christian cross and dove elements each offer smooth, clean lines to keep the look uncluttered, and are polished for a golden glow. 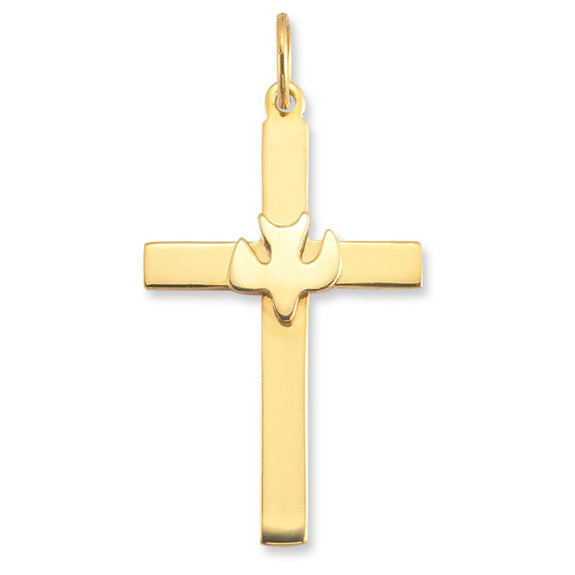 We guarantee our Christian Dove Cross Pendant in 14K Yellow Gold to be high quality, authentic jewelry, as described above.